NYC, 02/28/2019, 6:00PM. 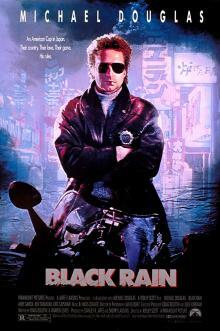 Black Rain (1989): NYC Cops in Japan, starring Michael Douglas. 125 min. Director: Ridley Scott. Starring Andy Garcia, Ken Takakura. Black Rain was nominated for the Academy Awards for Best Sound (Donald O. Mitchell, Kevin O'Connell, Greg P. Russell and Keith A. Wester) and Best Sound Effects Editing. The film was well publicized before its release, as it was Douglas's first film since winning the Academy Award for Best Actor for his role in Wall Street and his first film in a year. This film marks the first collaboration between Hans Zimmer and Ridley Scott. He would go on to score several more films for Scott, including Gladiator, Thelma and Louise, Hannibal, Black Hawk Down and Matchstick Men. Japanese actor Yūsaku Matsuda, who played Sato, died of bladder cancer shortly after the film's completion. Director Ridley Scott dedicated the film to his memory.The film grossed a total of $46.2 million in the United States and Canada and $88 million in other territories, for a worldwide gross of $134.2 million.